(Kitco News) – Global equity markets were mostly higher Thursday. U.S. stock indexes are also set to open firmer when the New York day session begins. It's been a light week for economic data in the U.S. and the world. So markets are still fixated on the new U.S. president. 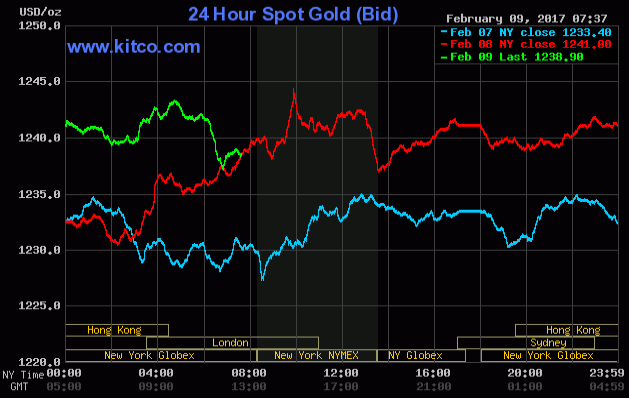 Gold prices are near steady in early U.S. dealings. Prices Wednesday hit a nearly three-month high and bulls still have upside technical momentum. The marketplace is still a bit apprehensive about any new directives issued from U.S. President Trump. Trump and Japanese Prime Minister Shinzo Abe meet late this week. Currency market traders are especially anxious regarding the U.S. naming countries, possibly including Japan and China, as currency manipulators. In overnight news, the German central bank said it moved 238 tons of gold back to Frankfurt last year, from locations outside the country. The U.S. dollar index is trading slightly higher Thursday morning. The greenback bulls are having a good week, so far. The other key "outside market" on Thursday sees Nymex crude oil prices trading higher on short covering after hitting a nine-week low Wednesday. A bullish weekly DOE liquid energy stocks report for gasoline on Wednesday helped to boost crude prices. U.S. economic data due for release Thursday includes the weekly jobless claims report and monthly wholesale trade.